Toyota’s thrifty midsize sedan gets even better mileage and is more practical than ever. A hybrid powertrain option has been part of the Toyota Camry lineup since the 2007 model year, and so with this year’s all-new Camry sedan comes a new electrified version. 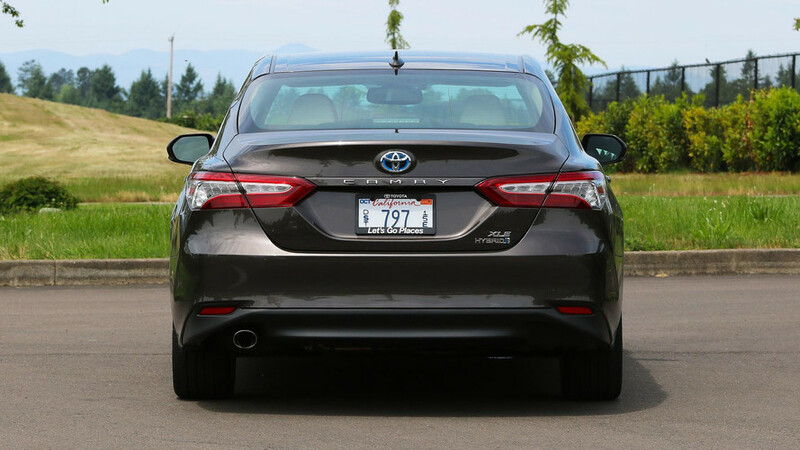 More efficient, more practical, and with all the other changes applied to the regular 2018 Camry – read our First Drive here – the new Camry Hybrid makes a better case than ever for being your next daily driver. More trunk space. Because the battery pack is now under the back seats, there’s more trunk space than in the last Camry Hybrid – 15.1 cubic feet with the seats up, versus 13.1 before. Better yet, the rear seat pass-through is now open, so you can fold the back seats for more cargo room. The old Hybrid’s back seat did fold, but the tiny pass-through gap made doing so pretty much pointless. The new car’s 60/40 split seat provides much more flexibility. Drives like the non-hybrid. There are very few signs from behind the wheel that you’re driving a car capable of 52 mpg combined. 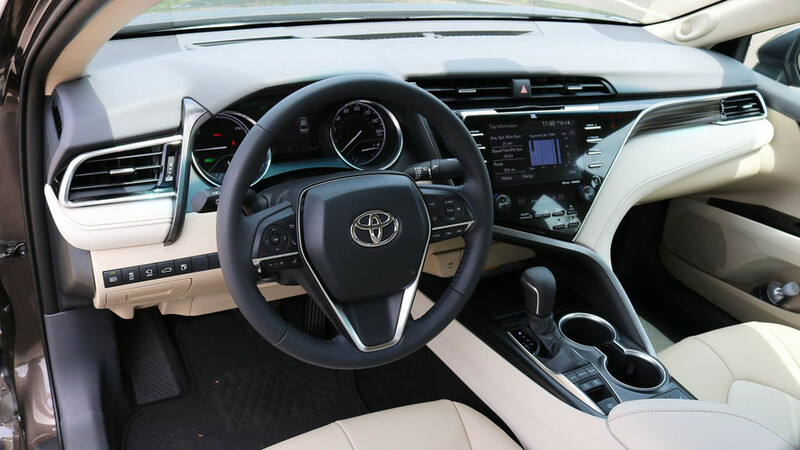 Sure, there are unique gauges and modes for the trip computer, but the Camry Hybrid has the sure-footed handling and steering of any other Camry model. Off-the-line acceleration is brisk, with more low-end punch than the four-cylinder car. Only a slight springiness in the first inch or two of brake-pedal application betrays the car’s eco-conscious roots. More powerful. 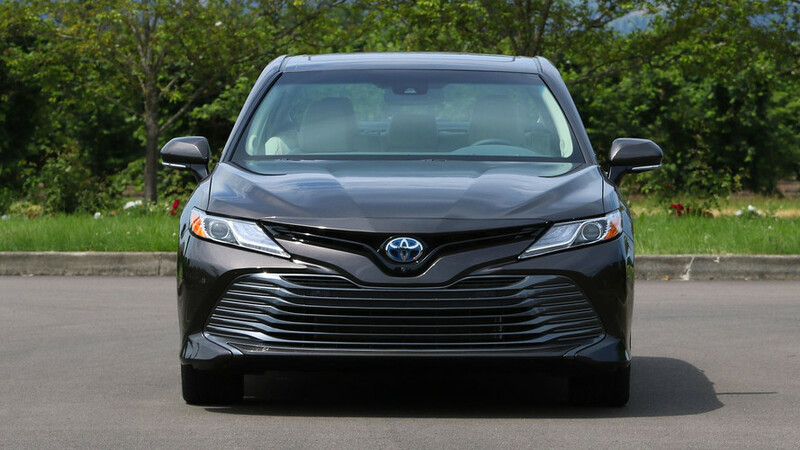 The 2.5-liter gas engine is stronger than the outgoing Camry Hybrid, which partly explains why acceleration feels so strong. You get an extra 20 horsepower and 7 pound-feet of torque (for 176 hp and 163 lb-ft), and combined total system output climbs from 200 to 208 hp. Crazy fuel efficient. 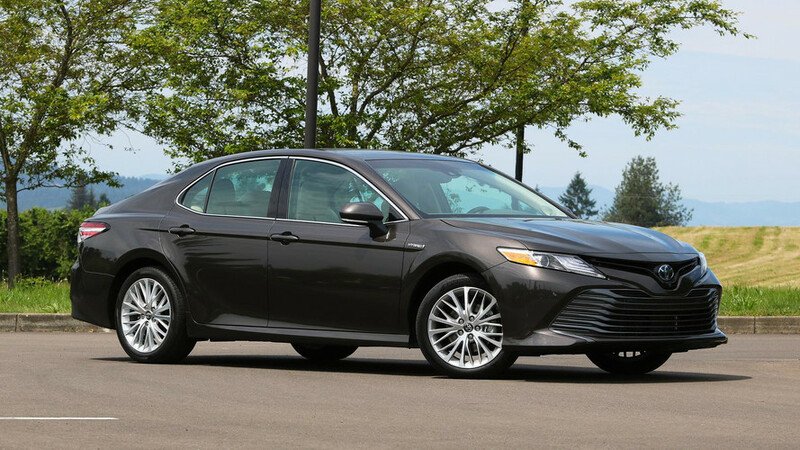 Fuel economy is much improved over the last Camry Hybrid, to as much as 52 miles per gallon combined compared to the 2017 model’s best of 40 mpg. With that figure, the Camry Hybrid is closing in on the EPA ratings of the Prius itself, which returns 52 mpg combined in most configurations or 56 mpg in its Eco version. Not everyone gets the headlining fuel economy figure. 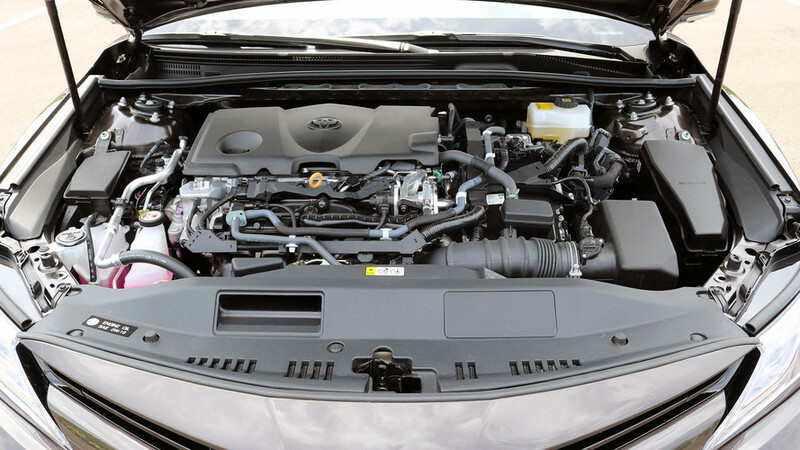 Buy the base Camry Hybrid LE and you’ll get estimated EPA ratings of 51 mpg, 53 mpg highway, and 52 combined. Elect the better-equipped SE or XLE trims and those ratings fall to 44/47/46 – still very good, but not quite so impressive. The LE is lighter and has a more energy-dense lithium-ion battery, whereas the SE and XLE have a nickel-metal hydride battery pack. The reasoning? The lithium battery is more expensive and 31 pounds lighter than the Ni-MH one, and because the SE and XLE models are already heavier, Toyota decided to put the thriftiest battery pack into the lightest car – and avoid bumping the high-trim cars’ prices any higher. No plug-in version. Unlike Ford, Hyundai, and Kia, Toyota does not plan to offer a plug-in hybrid version of its midsizer. Masato Katsumata, Camry chief engineer, says that there’s just no space to easily fit a larger battery pack. 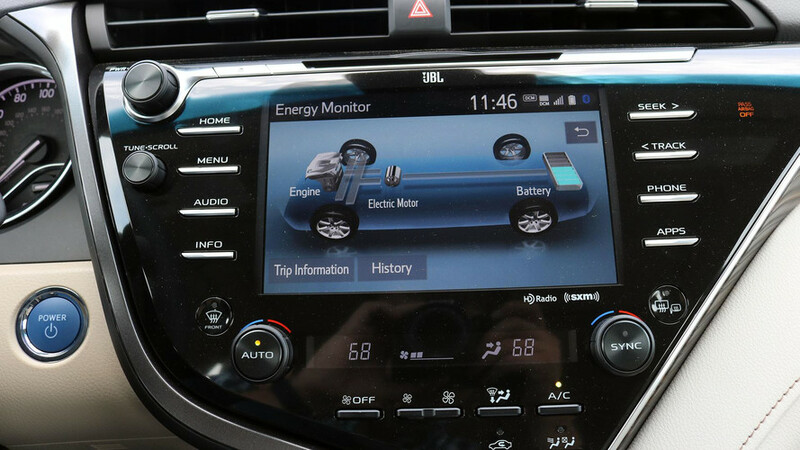 Because the main battery is under the seats, a plug-in model would need to add a secondary battery somewhere else. That would add cost, and because the battery pack would likely be in the trunk, you’d lose cargo space. In other words? Look to the Prius Prime if you want to plug in. Big price jump versus the non-hybrid. As ever, you’ll pay for the hybrid powertrain. In the case of the LE and XLE trims, it’s $3,800 more than an equivalent four-cylinder sedan; the SE Hybrid costs an extra $4,300. With gas prices so cheap and even the regular Camry now returning such impressive fuel efficiency, it’ll take a lot of driving before you make back the extra purchase price at the pump.